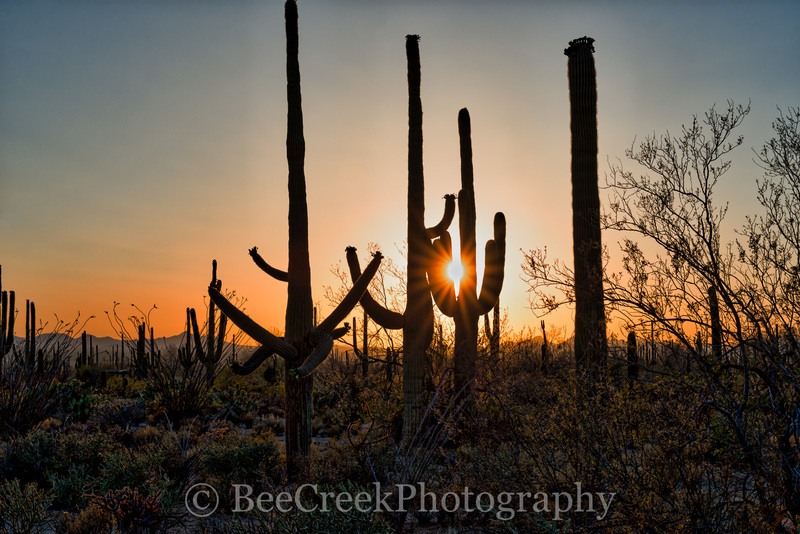 Sunset Thru the Saguaro - This is an image we capture of the Saguaro Cactus right at sunset as the sunset sparkled thought the branch of the cacti. You can see these proctected species so you cannot find them anywhere esle but in Arizona.Saguaros have a relatively long lifespan. They may grow their first side arm any time from 75–100 years of age, but some never grow one at all. A saguaro without arms is called a spear. The arms are grown to increase the plant's reproductive capacity (more apices lead to more flowers and fruit). The growth rate of saguaros is strongly dependent on precipitation; saguaros in drier western Arizona grow only half as fast as those in and around Tucson, Arizona. Saguaro grow slowly from seed, and never from cuttings, and specimens may live for more than 150 years; and grow to be over 40 ft tall. The largest known living saguaro is the Champion Saguaro growing in Maricopa County, Arizona, and is 13.8 m (45.3 ft) tall with a girth of 3.1 m (10 ft). The tallest saguaro ever measured was an armless specimen found near Cave Creek, Arizona; it measured 78 feet (24 m) tall before it blew over in a windstorm in 1986. Photo © copyright by Bee Creek Photography - Tod Grubbs / Cynthia Hestand.